Operation: We salvage trees from fence-rows that are being cleared and burnt. 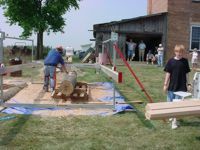 We mill them up, then use the lumber in our wood shop. This allows us to offer our customers wood types that most have never seen before. They make for great one-of-a-kind projects. Currently cutting all the wood needed for an addition to the house – Sycamore for the floors and Oak for the doors and trim. 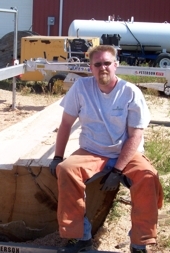 Best feature: MicroKerf blade on BIG logs and ease of transportation. Tip: Sharpen your blade often. Motto: Sawdust is just more fibre in your diet. Tom and his son show their mill to an inquisitive crowd at a local fundraiser. 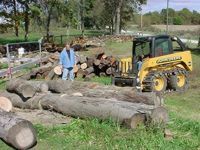 A buddy of Tom’s dropped off this load of logs that had recently been salvaged.